The problem with the “National Match” pistols is that there are two kinds: the “National Match” pistols which were built by government armorers for the Army Marksmanship Unit for the Camp Perry competition, and the Colt National Match pistols which were produced by Colt for the retail market. An example of the government-built pistols is the “Drake Slide National Match” worth about $1200 in 100% condition. The old National Match Colts made between 1933 and 1941 bring $2700 to $3600 in 100% condition. The models with adjustable sights bring approximately $700 more. These pistols differed from the standard grade because they incorporated a match barrel, checked trigger, checked mainspring housing, walnut stocks and the internal parts were hand-honed. Also included on later versions were a ramped front sight and an adjustable rear sight. These models were marked “NATIONAL MATCH COLT Automatic Calibre .45” on the left side of the slide. During World War II, the National Match Model was discontinued, but resumed in 1957. In 1957 Colt began to produce “Gold Cup National Match” pistols which they produced until 1970. In 100% condition, these pistols are worth about $1000. There was then a “Series 70 Gold Cup National Match, produced between 1970 and 1983. These bring $950 or better in 100% condition. Between 1983 and 1996, Colt produced the “Gold Cup MKIV Series 80 National Match.” The are worth about $800 in 100% condition. The current marking is “Gold Cup Trophy” begun in 1997. By 1919 there were National matches, first at Caldwell NJ and then later at Camp Perry, Ohio. Henry “Fitz” FitzGerald, as Colt’s representative, did a thriving business at Camp Perry replacing barrels and tuning triggers starting in 1920. In 1932, at the National Matches, Colt introduced it’s first National Match Model. More smoothly fitted than the Commercial Model, it was soon made available with the Stevens adjustable rear sight, as is also found on the early model Ace .22 conversion units. This pistol’s production was curtailed upon our entry into WWII and not continued after the war’s end. 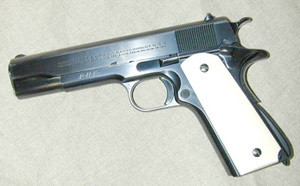 By 1933 Colt was offering a “National Match” pistol from the factory. Little more than a slightly tuned 1911A1. They were most likely found in the cabinet of a well-to-do gentleman or the holster of a LE officer who was also an astute gunman. By the late ’30s “Fitz” was joined by other’s who specialized in the 1911 as a fighting tool and as a match gun. You have to remember that hitting the target was a real issue for some of the men who came to Camp Perry. Many times their practice was on moving targets who shot back! In 1954 the Army began to experiment with match grade pistols. As they learned what improved accuracy and what the shooters preferred, changes were made. Some of the early Army National Match pistols had variations such as plastic triggers or rubber front strap covers. Large fixed rear sights were standard with micro adj. sights as an option by 1959. Hard slides were made for these pistols. 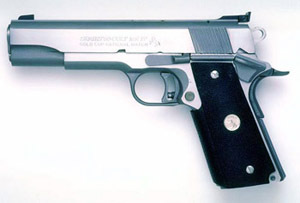 The early slides were made by Colt with normal Colt markings. Colt’s second Match slide was unmarked on the left side except for part # 7790314 . The third type slide had serrations like the Gold Cup and the Part # 791435. This slide was also made by the Drake Manufacturing Co. These pistols were periodically returned to the Armory and updated. The latter triggers were made of aluminum. Production was halted by the closing of Springfield Armory. In 1957 Colt re-introduced it’s NM in a much changed version. Known as the Gold Cup it had adjustable sights, a wider trigger with a stop and many cosmetic and practical changes. The slide was lightened as much as possible by internal machining to allow it to function well with wad cutter ammo. This weakened the slide for hot loads and the pistol quickly got a reputation as a wad cutter only pistol. These cuts were eliminated in the new Series 70 Model so it is stronger. The barrel on the Gold Cup has a narrower hood than the Government model so it is not readily interchangeable. A hood can be cut down satisfactorily with a little filing. A special barrel bushing was made for this model with a 45 degree angle on the recoil spring plug and a mating cut in the bushing. This bushing was eliminated when the Mark IV/Series ‘ 70 was introduced. “Upon returning from Southeast Asia in May of 1968, my cousin and I bought identical Colt National Match pistols. As you know, these were the forerunners to the “Gold Cups”. The old style National Match had the solid bushing rather than the collet type used in the Gold Cups. The guns had a much lighter slide and came with a weaker (10-11 lb.) recoil spring than the government models. Our pistols were equipped with a match trigger utilizing an adjustable over-travel stop, Elliason adjustable sights and a wide front sight. The finish was Colt’s “Royal Blue”, to this day, the most beautiful finish I’ve ever seen on a gun. The bluing looked six inches deep. In 1958 the Air Force begin to intensify their competitive marksmanship program. The Air Force Marksmanship school, which trained range instructors, became the nucleus of this activity. By 1960 they were installing special barrels, bushings, triggers and sights and hand fitting their pistols. These pistols were designated AFPG or Air Force Premium Grade. The earlier models were just marked A F. While the total production of these conversions is unknown, ten thousand would be in the ball park, probably. The accuracy requirement of these pistols was to fire, from a machine rest, three consecutive ten shot groups at 50 yards, with no group exceeding 3″ (center to center). Some of these pistols were built up Army National Match and early Gold Cup Models. A custom section built up weapons for the top AF shooters (Blue Team). These pistols were often customized with extended front sights, muzzle weights, etc., and were marked AFPG also. An H or W was stamped on the barrel to indicate a hardball or wad cutter model. The Gunsmith’s mark was placed on the right side, below the magazine. Match .38 AMU – Chambering a .38 Special rimless cartridge, this variation was manufactured by Colt from a .38 Super frame and has .38 Super serialization with a .38 AMU conversion kit slide. The Army took .45 frames and assembled their guns using .38 AMU kits with a blued finish. Super Match .38 – This pistol is like the Super .38 but had a hand-honed action and match grade barrel. Manufactured between 1935 and 1946, there were both fixed and adjustable sight variants. Drake Slide National Match – Drake made slides only for use by the U.S. Army Marksmanship Unit to allow assembly of match guns. The 1964 National Match pistols are unique as it was the only year the armory used Drake slides which are specially machined and hardened. According to Springfield Armory records only 800 pistols were produced in 1964 (Considered to be one of the rarest and most desired variations) and only 195 sold to civilians through the DCM. Government National Match Reworks – These pistols were assembled by government armorers with all parts marked “NM” and had a parkerized finish. Most will have “S.A.” markings for Springfield Armory. Air Force National Match – These are government National Match reworks made specifically for the Air Force Shooting team. They will have “AFPG” or “A.F.” stamped on the slide. Colt National Match – Chambered in .45 ACP, these were basically Government Model pistols with hand honed actions, match grade barrels, and exceptionally fine blued finish. They were manufactured between 1933 and 1941. Their serial number range will be within C164,800 – C215,000. These pistols came in both fixed sight and adjustable sight models. Gold Cup National Match – Introduced in 1957 in .45 ACP, the Gold Cup National Match was fitted with a match grade barrel, collet-style bushing, flat mainspring housing, long adjustable stop trigger, a hand fitted slide with an enlarged ejection port and adjustable target sights. It had the gold medallion in the grips and “NM” suffix on the serial number. These pistols were manufactured between 1957 and 1970. Gold Cup MKIII National Match – Chambered in .38 Special rimless, this pistol was like the Gold Cup National Match. Serial numbers have “NMR” or “MR” suffixes. These pistols were manufactured between 1961 and 1974. MKIV/Series 70 Gold Cup National Match – Chambered in .45 ACP, these pistols have a flat mainspring housing, accurizer barrel and bushing, adjustable trigger, target hammer, solid rib and Colt-Elliason sight. They were manufactured between 1970 and 1983. MKIV/Series 70 Gold Cup 75th Anniversary National Match – Similar to the Gold Cup Series 70, except it was built as a commemorative for Camp Perry in 1978. Only 200 pistols were built. Gold Cup MKIV Series 80 National Match – Chambered in .45 ACP, this pistol has Colt-Elliason adjustable rear sight, wide groove adjustable target trigger, under cut front sight, flat mainspring housing, and hand-honed internal parts. In 1992 they were modified to accept 8-round magazines. These pistols were manufactured between 1983 and 1996. Stainless Gold Cup National Match – Same as Gold Cup but built in stainless steel with a matte finish between 1986 and 1996. .38 Super Elite National Match – This is a two-tone gun having a stainless slide and blued frame which was a special edition by Accu-Sports. Bullseye National Match – Chambered in .45 ACP, this pistol was hand built, tuned and adjusted by Colt gunsmiths for precise match accuracy. It includes factory installed Bomar sights, a carrying case and 2 extra magazines. Manufactured from 1991 through 1992. Presentation Gold Cup – Chambered in .45 ACP, this pistol is like the Gold Cup Series 80 National Match but adorned with a deep blue mirror bright finish and accented by a jeweled hammer, trigger and barrel hood. Supplied with oak and velvet custom case and Manufactured between 1991 and 1992. Gold Cup Trophy – Chambered in .45 ACP, this pistol has a flat mainspring housing, 7 or 8 round magazines, accurizer barrel and bushing, adjustable trigger, Colt-Elliason sight, checkered wrap-around rubber grips and ships with a test target. Built since 1997. 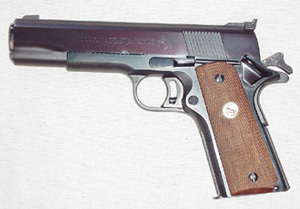 This model replaced the MKIV/Series 80 Gold Cup National Match in 1997 and is only available from the Colt Custom Shop. It also comes in a stainless steel version. and I am not a gun trader so I am not up on the latest market prices for collector guns. Special thanks to Sam Headrick, Andy Wander, and Dane Burns for contributions to this article.